A tourist on an African safari came across a precocious little elephant who wanted to show just how big and strong he was. The little guy decided to practice charging at the strange metal animal carrying tourists who were snapping photos. The baby elephant puffs up his little ears to charge.But then he gets embarrassed, and hides behind a bush. "OMG, did I actually do that?" The little guy suckles his trunk for comfort ... ... then tries again. "OMG, I did it again. "Finally, the little guy goes back to mom. You'll be big and strong soon enough, little one. Remember: It's always good to give a little extra space to the animals who call the land you're traveling through home. 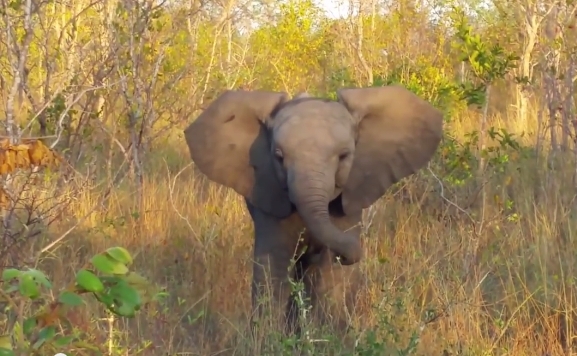 Responses to "Adorably Ferocious Baby Elephant Attempts To Intimidate Visitors (VIDEO)"